High performance teamwork rarely happens by accident. It’s a lot of work, but the effort yields powerful results. The Team Resources family of diagnostics is designed to help you build teams that thrive and accomplish powerful results. Please call us at 800-214-3917 for teams larger than 25 people. 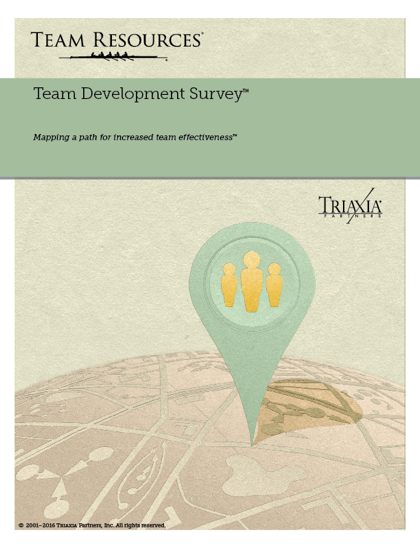 The Team Development Survey enables your team to visually identify its current stage of team development by measuring the two foundational factors of team cooperation: skill and willingness. Through measuring these capabilities in both your overall team and in each of your team members, the Team Development Survey enables your team to better understand and achieve its potential for greater collaboration and effectiveness. and begin your online diagnostics. The Team Performance Survey assists your team in evaluating its strengths and weaknesses against each of the six characteristics of a high performance team. The resulting Team Performance Report is designed to allow your team to address its development needs in a confident, prioritized manner. It then enables your team to evaluate, interpret, and discuss the results. Your team will be able to develop a practical and focused action plan to drive real results. The Team Communication Profile helps your team assess its ability to effectively communicate. Real team communication doesn’t just happen, but rather it demands the application of time-tested principles and processes. This communication skills inventory enables team members to identify and address specific issues that clutter and confuse team communication. Meetings are the playing field for high performance teams. Effective or not, meetings cost money and consume valuable resources. The real issue is not the cost of meetings, but rather the cost of poor meetings. This diagnostic enables your team to graphically identify strengths and weaknesses across each of the factors that drive successful meetings, and map out key next steps for improvement. The Team Conflict Profile enables your team to identify and address the conflict issues that drive ineffective conflict on your team, highlighting the attitudes, actions, and processes that can stifle your team’s ability to work together. Using this information, your team will be able to address its key challenges and define a clear path for improvement. © 2011, 2013 Triaxia Partners, Inc. All rights reserved. TRIAXIA Partners has been helping clients identify, ask, and answer their most important business questions for over 30 years. We support our management consulting and development services with a portfolio of tools and services that include training and learning solutions, materials, and assessments for the overall organization, teams, and individuals—all designed to help clients transform their vision into reality. We are available to answer your questions or help you set up orders. Our help desk is open between 8:30 am and 5 pm EST, Monday through Friday.